Dubai, UAE, January 3, 2018: After the holiday season, the chances are that your skin is showing the effects of lack of sleep, indulging in rich food and excessive partying. The Fillerina Plus Day Cream is the ultimate treatment to help your skin recover and get back in shape throughout the coming season. This daily filler treatment cream is designed to moisturise, protect and replenish your face and neck without leaving a greasy or sticky feeling. Formulated with 8 Hyaluronic Acid (HA) molecules, as opposed to the usual 6 HA molecules found in the regular Fillerina treatments, Fillerina Plus Day Cream is designed to correct deep set wrinkles caused by aging. It penetrates deeply into the skin to help reduce the appearance of fine lines and leaves the skin feeling more supple and soft. Fillerina Plus Day Cream is available in two different dosages, Grades 4 and 5. Grade 4 is targeted for remediating evident relaxation and sagging of tissues, while Grade 5 is suited for repairing the tissues of more mature skin. For best results, apply a small amount of the cream on your face and neck with your fingertips, to let it penetrate deeply in to your skin. 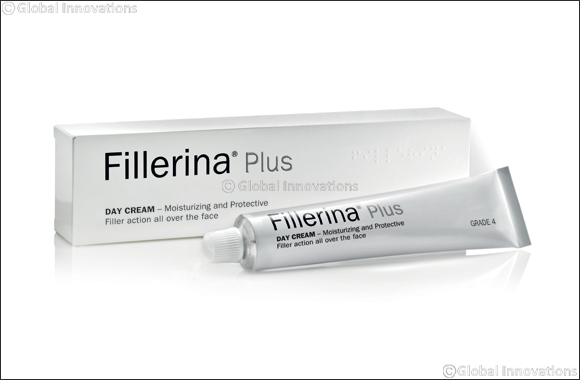 The Fillerina Plus Day Cream is suitable for use on its own as well as in conjunction with other Fillerina treatments. Fillerina Plus Day Cream is available at all leading pharmacies across the UAE and is priced at AED 449 (Grade 4) and AED 499 (Grade 5).